Open Live Writer Version 0.6.1.0 for Windows 10 is now available at Windows Store. 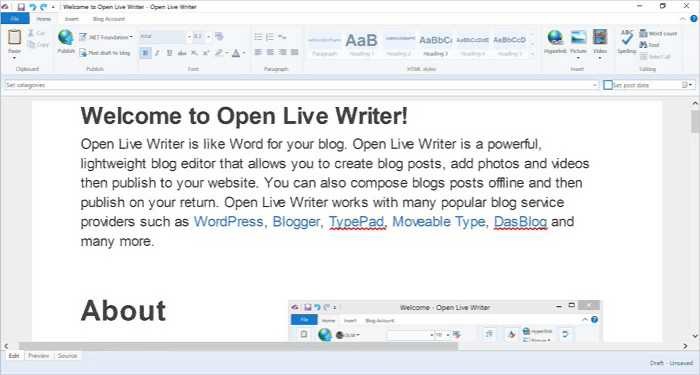 The Open Live Writer is a open source version of Microsoft’s Windows Live Writer program. Microsoft used Desktop App Converter to convert the program into a Windows app and upload it to the Windows Store. This release contains two major new features, spellchecking and categories for Google Blogger! Only one language can be spellchecked in Writer at a time, but you can change the language at any time by going to File > Options > Spelling and choosing a new dictionary language. Google Blogger categories will automatically populate for easy tagging of your blog posts. In addition to categories, there are several other Google Blogger bug fixes in this release. The most notable issues were time zone differences causing scheduled posts to be scheduled at the incorrect time, failing to open drafts that were posted to Blogger, and failing to download and open posts from Blogger that are older than your most recent 500 posts.